I will be hosting three seminars to provide constituents with tips to safeguard their identities. The free forums will feature Jerry Mitchell, Education and Outreach Specialist with the Office of the Attorney General. 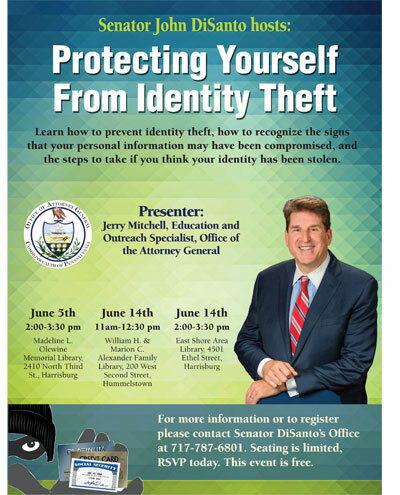 I invite constituents to register for these free seminars to learn how to prevent identity theft, how to recognize the signs that their personal information may have been compromised, and the steps to take if they think their identity has been stolen. For more information or to register please contact my office at 717-787-6801. Seating is limited. Legislation I am sponsoring to authorize education savings accounts (ESAs) for students in the lowest 15 percent performing public schools in the state was approved Tuesday by the Senate Education Committee. Under Senate Bill 2, the state share of education dollars available for families with ESAs would average $5,700 and be deposited into restricted-use, online accounts controlled by parents and supervised by the state. The local school district would keep approximately two-thirds of their total per student funding despite no longer having to educate these students. This bill can reduce class sizes and increase per-student spending in underperforming school districts. Participating families could spend ESA funds on a variety of educational services including: private school tuition, curriculum, certified tutoring, and approved therapies for students with special needs. Schools receiving ESA dollars will be subject to accountability and student achievement measures, the results of which will be publicly accessible. I am grateful to my fellow members of the Education Committee for sending a lifeline to kids who, because of their zip code and modest family finances, may be trapped in a low performing school that isn’t meeting their educational needs. ESAs fulfill the mission of public education, which is to ensure all children have access to a high-quality education and can reach their maximum potential. We should give kids in the poorest performing public schools a real opportunity to get the education that works for them. I call on the full Senate to take up this bill soon. The Senate approved legislation Wednesday that would lead to tougher sentences for crimes of domestic violence committed in front of children. According to research, half of domestic violence crimes were committed in the presence of at least one child. When these children grow up they are more likely to engage in dangerous behavior and are more likely to become an abuser or be abused themselves. Passage of Senate Bill 1092 follows March’s Senate passage of a crime victims package targeting domestic abuse. House Bill 566 provides for the suspension of services by a contractor or a subcontractor if timely payment is not received in accordance with the terms of a construction contract. The bill returns to the House of Representative for concurrence on Senate amendments. I voted against this bill because I believe the proposal unnecessarily interferes in private contracts and each party’s ability to negotiate their most favorable terms. The I-83 corridor is undergoing significant upgrades that will lead to better roads but will require new traffic patterns and occasional delays during construction. The projects address worsening roadway conditions, high traffic volumes and congestion, and safety. The roadway was designed more than 50 years ago and does not include the modern safety features needed for roadways that have many vehicles traveling at high speeds. You can find the latest information on construction at I-83 Beltway.com. It covers several sections of the East Shore and West Shore, and includes construction timelines and projected dates of completion. A new page has been added to the website to explain the transportation project development process. Successful companies are the key component to a healthy Pennsylvania economy. They employ residents, provide family sustaining wages, generate tax revenue and attract other companies to the Commonwealth. The Department of Community and Economic Development’s Workforce and Economic Development Network of Pennsylvania, WEDnetPA, provides qualified employers training for new and existing employees. The training allows companies to stay competitive by keeping employee skills current and relevant. Eligible in-state businesses and out-of-state companies relocating to Pennsylvania may apply to WEDnetPA to access training funds. The funding can be used for a wide range of training, categorized as either Essential Skills Training or Advanced Technology Training. More information can be found at www.wednetpa.com. May 26-28 — Gamut Theatre Group’s Popcorn Hat Players will host KIDSFEST, the children’s section of Artsfest of greater Harrisburg. June 16 – Elizabethville Area Community Alliance car show to raise funds for the Elizabethville Community Pool and Splash Pad project. The Senate returns to voting session on Monday, June 4 at 1 p.m. You can watch session live at SenatorDiSanto.com.